Our hand made to measure, vertical louvre blinds come in 3 1/2 inch (89mm) and 5inch (127mm) slats. The aluminium top rail is available in either white or silver and can be face or top fixed. The rail contains self-aligning carriage trucks preventing the vertical slats from running out of sync. Your vertical blind slats can be stacked to the left, the right, or split drawn - stacking evenly on either side of your window. You will recieve your vertical slats pre weighted and chained (white) for simple and easy hanging. With so many modern vertical blind fabrics to choose from, you can transform your window into a beautiful but practical visual centre piece of the room. Our large selection of quality materials include dim out, black out, machine washable, fire retardant (certificates available on request), voiles and pvc and are diamond stitched for strength and durability. Please take a look at our vertical blind fabrics and take note of the range letter (B, C, D and so on) of your chosen fabric. 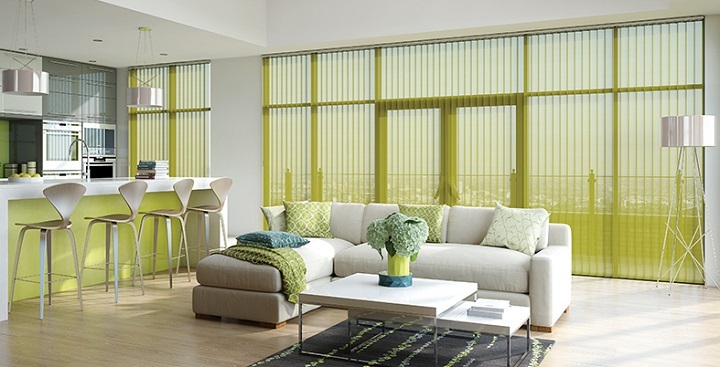 We also supply replacement vertical blinds slats, rails, chains, weights and hangers, please contact us for more details. For a Vertical Blind quote, please fill in the form below and we will get straight back to you.